JK Bank PO Admit Card 2019 is Available Now!! The officials of the Jammu And Kashmir Bank will release the JK Bank PO Hall Ticket 2019 for the Preliminary Examination. 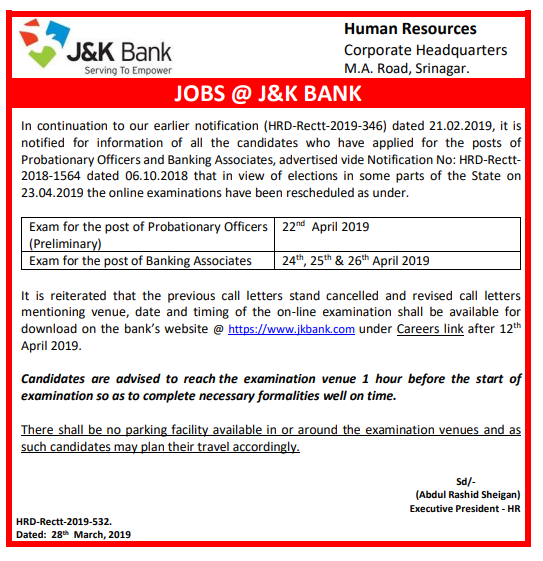 Furthermore, candidates can then download the JK Bank PO Prelims Hall Ticket 2019 on their official site @ jkbank.com. Moreover, the जम्मू और कश्मीर बैंक officials have also scheduled the JK Bank PO Exam Date as 22nd April 2019. 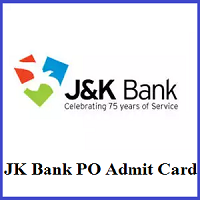 The direct link to download the jkbank.com PO Admit Card 2019 is attached to the end of this page. The officials of the Jammu And Kashmir Bank had announced the JK Bank PO Exam Date as 22nd April 2019. And the jkbank.com Selection Process 2019 is as done as follows. Candidates should bring the printout of their JK Bank PO Admit Card 2019 in the examination hall. Candidates should download admit card before the date of exam. ★ For any other information of the JK Bank PO Prelims Hall Ticket 2019 or any, then candidates can make a move to the Official Website Of JK Bank. Candidates who are ready to download the JK Bank PO Admit Card 2019 need to observe the below given steps that are to be followed to take it safely. Move to the official site of the Jammu and Kashmir Bank @ jkbank.com. On the home page, you can find the Careers link on the top of the screen. Then you will be redirected to the new window. Later on, you need to observe the Jobs section. Soon after clicking it, you need to enter your valid credentials like the Registration No / Roll No, Password / DOB (DD-MM-YY) and then enter the recaptcha code int he provided field. And now, your valid JK Bank PO Admit Card 2019 will be opened on the screen. Download it and also take out the printed copy for further usage. Keep it safe and don’t forget to carry it to the examination hall. Furthermore, to get all the updated information of the JK Bank PO Admit Card 2019, you can just stick on to our only on our FreshersNow.Com so that you will be updated with the latest news.